During the Holidays our lobby’s tree is alive with decorations, lights, and wishes. 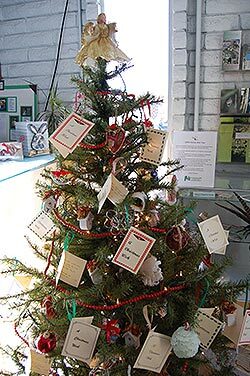 Wish cards dangle here and there, each announcing a need we have, be it supplies for our educational programs, tools for our stewardship programs, or even donations for specific critter care (the snakes don’t feed themselves!). Check out the drop down menu below to see if one of our wishes speaks to your heart. Just like regular donations, these are tax deductible and would qualify for matching gifts should you work for one of the many generous businesses that populate our region. Click here to make a donation in some other amount of your choosing…you can specify what you wish it to go towards in the comments. Call 408-298-7657 with any questions. You can also mail checks to our address listed in the lower right section of this web page. Comments — Please let us know if you have any comments regarding your donation. There are plenty of other ways to donate, check it out! And of course you can always donate your time by becoming a volunteer.